Albanese Rainforest Frogs are especially popular with children who will enjoy playing with their food as much as they do eating them. Each piece includes a solid frog shape with bent legs, webbed feet and a thick body with tapered head. The back includes subtle texture, recreating the look of real frog skin! Our bulk rainforest frogs gummies come in a rainbow of fabulous colors. Each includes a two toned pattern, with limbs in one color and a body in another. These two-toned frogs have an assortment of bright colors and juicy fruit flavors: Strawberry & Grape, Sour Lemon & Sour Apple, Blue Raspberry & Orange. Gummy frogs are a wonderful choice for kids birthday parties or any event with a rainforest or animal theme. Educators can encourage science studies by rewarding students with frog gummies. 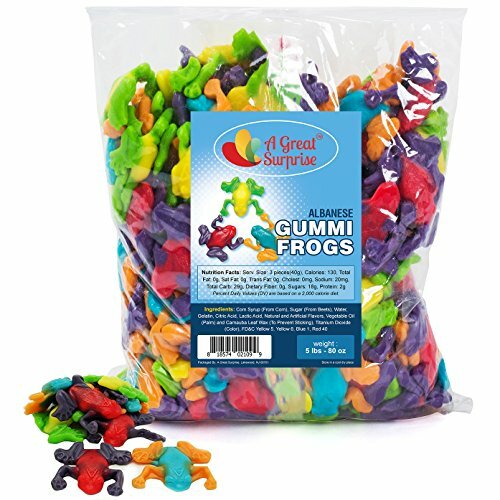 These Gummi Frogs are also a fun choice for cake decorating projects! They are perfect for all occasions and are a unique, fun candy to include as party favors or to serve to guests as a snack. Beautiful enough to put on display in an elegant candy bowl for any candy buffet. Buy in bulk to save money. Includes 5 lbs. Approximately 32 pieces per pound. Great candy that will be loved by kids of all ages (and adults too). Enjoy these sweet treats with many enticing flavors of the classic candy you crave. Items are repackaged in a facility that may contain milk, soy, peanuts, tree nuts, eggs, wheat and all other allergens. Albanese Rainforest Frogs are especially popular with children who will enjoy playing with their food as much as they do eating them. Each piece includes a solid frog shape with bent legs, webbed feet and a thick body with tapered head. The back includes subtle texture, recreating the look of real frog skin! Our bulk rainforest frogs gummies come in a rainbow of fabulous colors. Each includes a two toned pattern, with limbs in one color and a body in another. These two-toned frogs have an assortment of bright colors and juicy fruit flavors: Strawberry & Grape, Sour Lemon & Sour Apple, Blue Raspberry & Orange. Gummy frogs are a wonderful choice for kids birthday parties or any event with a rainforest or animal theme. Educators can encourage science studies by rewarding students with frog gummies. These Gummi Frogs are also a fun choice for cake decorating projects! They are perfect for all occasions and are a unique, fun candy to include as party favors or to serve to guests as a snack. Beautiful enough to put on display in an elegant candy bowl for any candy buffet. Buy in bulk to save money. Includes 5 lbs. Approximately 32 pieces per pound. Great candy that will be loved by kids of all ages (and adults too). Enjoy these sweet treats with many enticing flavors of the classic candy you crave. Items are repackaged in a facility that may contain milk, soy, peanuts, tree nuts, eggs, wheat and all other allergens. If you have any questions about this product by A Great Surprise, contact us by completing and submitting the form below. If you are looking for a specif part number, please include it with your message. Vintage Candy Co. THANK YOU GIFT BASKET CANDY BOX For Men Or Women | SAY THANKS With A Unique Assortment of Nostalgic Decade Candy PERFECT Gratitude Gift for Women Men Girls Boys Coworkers Teens Etc.